definitive shape in the 13th century with the king’s decision to construct the distinctive double-walled ramparts and extend the castle. 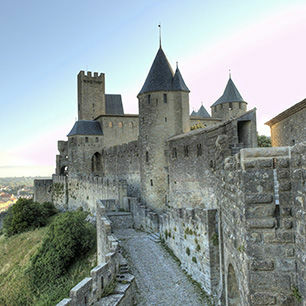 The city was restored by Viollet-le-Duc in the 19th century and is a testimony to 1,000 years of military architecture and 2,500 years of history. See a 12-minute film combining 3-D images and close-up footage; walk along the galleries, the fortified walls and the north ramparts; discover the museum of masonry and many other attractions. From October to March : last admission 30 mn before closing time. From April to September : last admission 45 mn before closing time. Battlements close 30 mn before closing time and left luggage 15 mn before closing time.